An invitation to adventure for all boys completing grades K-4 and their parents. Boys entering Kindergarten in the Fall are welcome to join our Lions program, beginning June 1st. What is Scouting? It’s fun, friends and family…. Where skills are learned, confidence is built, and stories are born. Scouting is learning by discovery and discovery by doing. It’s where a boy learns to trust and be trusted. A scout who hikes and camps learns to appreciate the outdoors and take care of it. 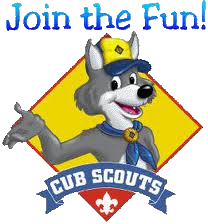 A Scout who is part of a den and a pack has a genuine sense of belonging. On the 3rd Tuesday of each month.